Whaaaa???? No actual recipe? You know your readers will be sorely disappointed. Actually, as Macie would say, I have no indication that anyone other than you has seen this posting. If others have been here they left no tracks—no comments or votes, either positive or negative. Oh, well—perhaps I am one of the many gifted writers that across the centuries have achieved recognition posthumously. Should that be the case, I may be able to obtain copies of articles published in praise of my literary efforts, and perhaps one or more of the plethora of biographies that will be compiled by the nation’s historians. The possibility exists, of course, that I would need to read them quickly before the heat causes spontaneous combustion. As for uncompleted writing assignments, I’m working on them—cut me a little slack, okay? Apparently you forget that I’m a hunt-and-peck typist. The fingertips of both my index fingers are heavily wrapped to control the bleeding, and that slows me down even more. 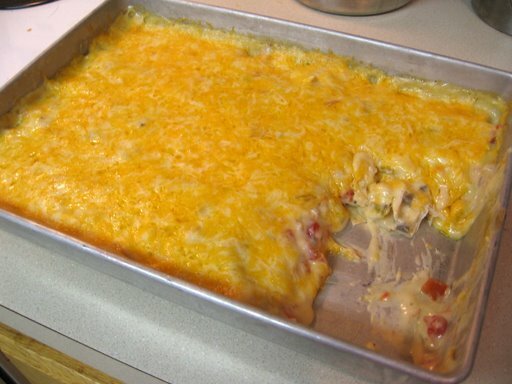 Your mom’s King Ranch Casserole is one of only three recipes that repose in the United States Bullion Depository located near Fort Knox, Kentucky. The other recipes are Tobasco Sauce and Kentucky Fried Chicken. To cheapen her recipe by including it in the 105 King Ranch Casserole recipes already online would constitute blasphemy—Google it here if you don’t believe me!